IMPORTANT WARNING - Some of these videos are extremely disturbing and should NOT be viewed if you are easily offended - this content comes from the Vine - one of the most popular online magazines on the planet... this does not make the following videos any less offensive. Please do not comment or email me if you are offended - I am warning you now - do not watch if you are easily offended!!!! I cannot make this disclaimer any clearer!! Making people physically ill has a long and disturbing tradition in Hollywood. Whether it is for comedy or terror there are moments when the disgustingly shocking scenes that transpire before our eyes become forever etched in our memory. Coincidentally like many a guilty pleasure, these moments become the most memorable raising the bar for cinema, however lowbrow that may be. Humour and horror have long relied on pushing the limits of viewers' tolerance for entertainment. The most memorable scenes of either genre became classics by causing a good proportion of the viewing audience to reach for a vomit bag. While many would argue stomach churning antics are merely cheap ploys at the absence of a good idea, time has proven otherwise. We celebrate those filmmakers who chose to challenge taboos or scrape the bottom of the barrel, depending on your view, and have compiled the top ten grossest movie moments. We recommend you enjoy these clips before having consumed any solids as they became classics for an obvious reason. It wasn't all hobbits and wizards for Peter Jackson in the early days of his career. Before becoming an Academy Award winning director he was making a fine living with great films like Braindead and Meet the Feebles. It's hard to choose one moment but this one is pretty tricky to top. The horrific and disturbing final moments that were a great source of nightmares. Without a doubt a modern classic but not as shocking as it was all those years ago. 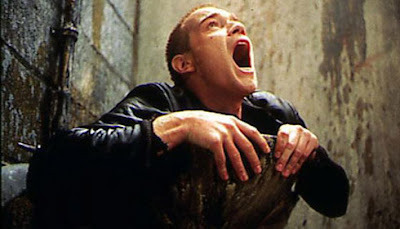 What makes this perhaps the grossest toilet moment on film is that we have all experienced the desperation and moral dilemmas posed by needing the urgent use of public toilet not suitable for swine. The vomiting scene by which all are judged. John Waters is renowned for freaking people out but he out did himself with this stomach churning moment. While the debate rages on, by most accounts there was no acting involved or props. That's right people, Divine really ate dog poop. The most disturbing aspect is how nice the waiter really is. Anyone who has seen this moment is constantly reminded of its impact when they ask food to be taken back. I still get panicky when anyone coughs at the dinner table.